2 Bedroom / 2 Bathroom Fully Self-Contained Units. All deluxe units have undergone a full refurbishment within the last 12 months. This includes air conditioned bedrooms and lounge rooms, new 32" flat-screen TV's, stylish black leather lounge suites, king size bedding and full new furniture packages. Rates for 4 people. Max occupancy 5 people. Charges apply for extra guest. Your choice of either 2 x King Beds or 1 x King Bed + 2 x Single Beds. Trinity Beach Accommodation: Four star luxury in five star surrounds! One, two and three bedroom, fully self-contained apartments. Dive and discover the Great Barrier Reef. Trek through the World Heritage Daintree Rainforest. 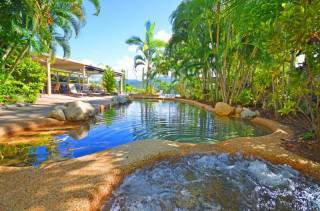 Soak in the sun and seaside atmosphere of one of nature’s most desirable beach destinations - Marlin Cove Resort is the most relaxing and beguiling Cairns holiday accommodation. 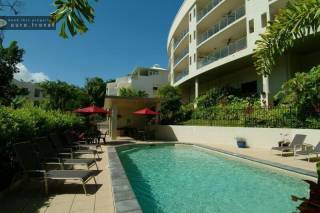 Nestled near the matchless Trinity Beach, the Cairns beach resort is a mere stone’s throw away from an afternoon swim, a shopping spree in fabulous boutiques, and a romantic alfresco dinner in the most famous restaurants in the northern coast of Queensland. Our Trinity Beach accommodation is ensconced in a picturesque rainforest corridor. Here, you can frolic with native animals and birds. Spend long restful hours at the spa or sandy saltwater lagoon pool of our Trinity Beach resort. It’s more than your average Cairns beach resort, more than a change of scenery - Marlin Cove Resort is a refreshing departure from your humdrum holiday destination to a world thriving with Queensland’s natural pleasures. Facilities include: a Lagoon Pool, Lap Pool, Spa, Sauna, Tennis Court, Games Room, DVD Hire, Library, Tour Desk & stunning landscaped grounds.